We harvest many trophy bulls on this spacious ranch in South Dakota. These hunts produce one of the most unique and beautiful trophies available. Many of which make SCI books. Hunts are conducted from Oct. through Jan. to ensure that the hides are at their prime. Excellent for stocking the freezers (as well as your neighbors). You will harvest an immature animal on this hunt (something the meat will be excellent on). You also receive the “trophy” parts as well. This option allows you to harvest something for the wall and the freezer. What a great opportunity for the hunter who is not concerned with record books! 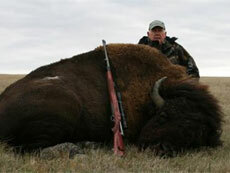 Most Buffalo hunts will now include two nights lodging and meals the day of the hunt.